We all love the downtime details of weekends: Chilly mornings making coffee on the tailgate of a truck, or cool evenings gathering firewood. 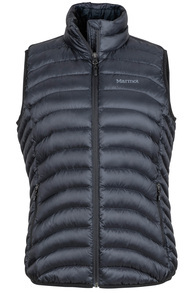 Warm your core for those moments between adventures in the down-insulated Women´s Aruna Vest. A classic piece, stylish in design and functional. 600 Fill Power Down with Down Defender. Elastic bound hem 2 outer zip pockets and one inner. Athletic fit. great piece for the chillier days where you need a little warmth but no bulk.